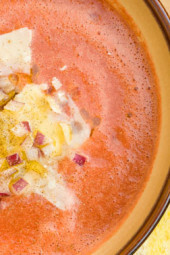 Gazpacho is a chilled soup traditionally from Spain, a perfect way to use up end-of-summer vegetables in your garden. It is traditionally made with tomatoes, cucumbers and peppers but you can get creative and make variations. For a Mexican Gazpacho you can add avocado, cilantro and jalapeño, for an Italian Gazpacho add fresh basil and Parmigiano Reggianno. Personally… I prefer my soup spicy with jalepeños, cilantro and avocado. How do you like your gazpacho? Place tomatoes, cucumber, bell pepper, garlic, salt, pepper and vinegar in the blender until smooth. Chill in refrigerator 1/2 hour. Pour into two large bowls and top with 1 tsp olive oil in each bowl, chopped red onion, salt and pepper plus toppings (shaved parmesan or avocado if using). This was my first time making it, and I have to say it was interesting to have cold soup for the first time, but very yummy. Next time I won't add so much "tang" to it. Is there anything you could use in place of the red wine vinegar? I LOVE the idea about using leftover salad as a "starter" for your own gazpacho! Just ate lunch at a little out of the way mexican restaurant in PA and ordered a cup of gazpacho…it was delicious and I remarked to my husband "it tastes jut like my gazpacho." Here is a little tip. Never throw out your leftover salad. I make salad with romaine, or whatever lettuce I have on hand, tomatoes, peppers, onions, etc. and always dress it with oil and vinegar dressing. Leave it in the fridge overnight and the next day after, just pulse it in your blender or food processor and make it chunky–add more tomatoes, hot sauce, whatever. The flavor from the salad sitting overnight is fantastic. A little dollop of avocado mash or sour cream or both and it's the best you'll ever have. The vinegar adds zip. I LOVE GAZPACHO. My grandmother is Mexican, and my mom makes it by the bucketful when our tomatoes start coming in full swing! My mom uses a food processor and keeps the veggies still kind of cubed, so there's more texture to it. We eat it plain with a slice of bread – Mom has to stand guard in front of the fridge while it chills so my sisters and I don't stick our fingers in it! No I haven't, Why not! Have you ever frozen this recipe? I'd love to put some in my freezer to have over the winter! 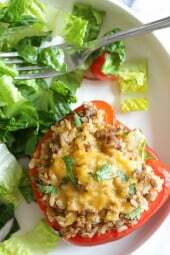 I really loved this recipe – it was delicious, and I didn't even put any toppings on it. I will definitely make it again and again and will try some toppings! 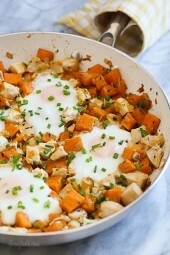 Thanks for another tasty and super healthy recipe. Gotta have kosher salt! Love it. Also love sea salt. I LOVE Kosher salt! It has a nice little crunch to it. There are many kinds of salts, such as pink salts, black salts, and other colors, made from different parts of the worlds. You can find grinders at your International and gourmet stores as well as Ross and Marshalls. Alton Brown of Good Eats-Food Network does a whole program on salts and the history of them. I like kosher salt because it's a coarse salt, great on meat, but that's just my preference, table salt would always work in place of kosher. I tend to over salt things when I use regular table salt. I have always heard the chefs on Food Network mention using Kosher Salt. What is the difference between table salt and Kosher salt? Kosher salt? talk about a great marketing scam! Hi Gina, I never succeeded in making a tasty Gazpacho but I'm sure I will succeed with your recipe!! Thanks a lot! I love this! 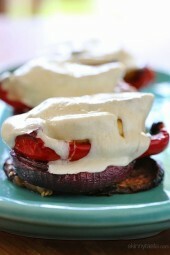 You have such a fun blog with super fun recipes and ideas! 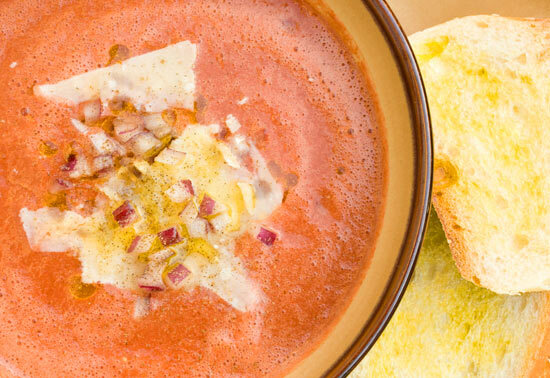 Thanks for sharing your amazing Gazpacho recipe too! I can't wait to try it! I love gazpacho! I like to throw everything in a blender and let it chill. When I am being extremely lazy, I'll take a can of V-8, add some cut up veggies and wa la! I like green onions on it sometimes too. I love avocados, so I will definitely have to try that!